This peak is #11 on the Height List for Alberta . This peak is #31 in Prominence List for Alberta . This peak is #27 on the Height List for British Columbia .Located at the head of Lyell Creek and Arctomys Creek. 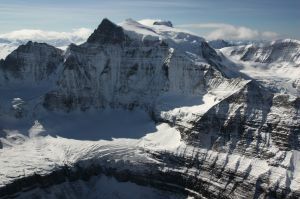 Mount Lyell is a heavily glaciated peak that sticks a few hundred meters above the Lyell Icefield. One can ski almost to the summit, although most will remove skis and kick steps for the final slope. The three northernmost peaks of Lyell can easily be climbed in one day from the same camp. The 2 most southern peaks typically require a second day, since they cannot be easily traversed along the ridge. They are most easily climbed by descending to the Lyell Icefield, then going around to the south. Name Notes: Adopted in 1912. In 1858, James Hector named the entire massif "Mount Lyell" in honor of Sir Charles Lyell (1797-1858). In 1972, the 5 sub-peaks were given separate names after 5 swiss guides. See Rudolph Peak, Edward Peak, Ernest peak, Walter peak, Christian peak. Sir Charles Lyell (1797 - 1875) was best known for his geology work and popularizer of uniformitarianism. Uniformitarianism is the principle in which one assumes that the same processes that shaped the universe occurred then as they do now, unless there is good evidence otherwise. His most important work was in the field of stratigraphy. In 1828, he travelled to the south of France and to Italy, where he realised that the recent strata could be categorised according to the number and proportion of marine shells encased within. Based on this he proposed dividing the Tertiary period into three parts, which he named the Pliocene, Miocene, and Eocene. His book "Principles of Geology" was the most influential geological work in the middle of the 19th century, and did much to put geology on a modern footing. Lyell was a close friend of Charles Darwin, and one of the first to support "The Origin of Species", although he never fully supported natural selection as the driving force behind evolution.